I'm so excited to share with you Big City Bags (which releases tomorrow!) written by my friend Sara who blogs over at Sew Sweetness. I made friends with her way back when I started SewCanShe because I wanted permission to feature some of her adorable free tutorials here on my site and I just love her to death! Sara designs bags and purses (among other things) that are extremely useful and straightforward in construction. 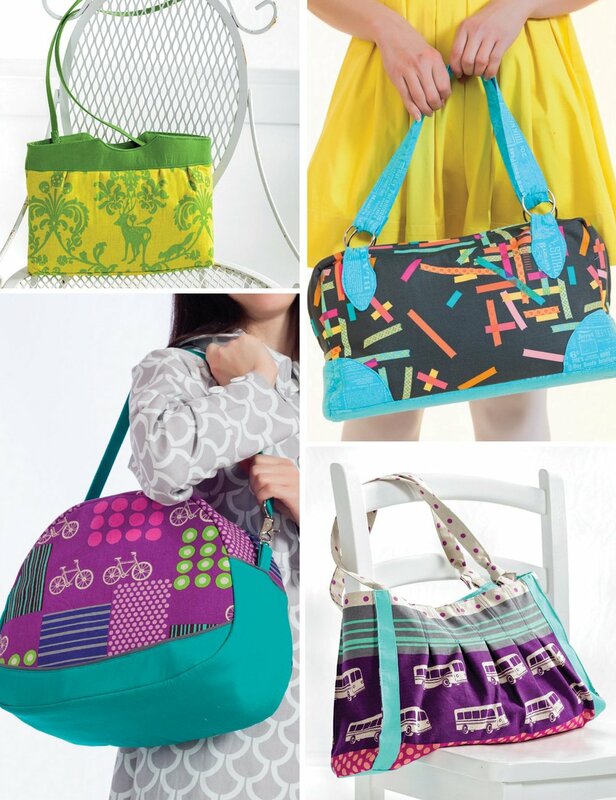 In addition to Big City Bags (which comes out this month), Sara has a line of pdf sewing patterns you can find at Sew Sweetness Patterns. Big City Bags contains 12 amazing bag designs, plus helpful sections on interfacing and general bag making techniques. I know this because after Sara asked me to review her book, I received a complimentary electronic copy (yeah, I know you're jealous because I got the book way before it came out). This happened to be perfectly serendipitous because it was just in time for me to sew a new bag to take with me to Quilt Market last month. But I had a very hard time choosing among those 12 super cute bag designs! I ended up picking the Sound Check bag which is the lower right one in the picture above. Then I got this fabulous Japanese Cotton-Linen blend fabric from Maigo. She has all of those hard to find Japanese fabrics that I love so much - plus some new one I hadn't seen before. The dark blue bird print that I used for the lining is organic quilting cotton by Rashida Coleman-Hale. So cute. The Sound Check Bag is a nice roomy size, perfect for when you have to tote stuff around but you still want to look cute doing it. I got so many compliments on it, and everyone was thrilled to find out that they could find the pattern in Big City Bags (which almost everyone wanted to get anyway, lol). And here's my little tip for us last minute stitchers: I waited until it was too late to order bag hardware online, so I ran over to Lowes and got bronze curtain rings. 10 for $10 and they look awesome! The next bag I have on my list to make is this one: The Honeymooner Suitcase. I'm no honeymooner anymore, but it will be perfect for my 8 year old to take on overnighters with grandma. I also have to make this one for myself: The Wonderland Bag. It's such a sweet size and shape! So here's the funnest part of all... just answer this simple question in the comments below to enter to win your own copy of Big City Bags: How many handbags/purses do you make each year? This giveaway is now closed. Congrats to the winner!